We booked here as there's a scheduled black-out in our area. Two rooms were assigned to us (a group of 4 adults with one toddler). The building should be relatively newly-built (~10 yrs?) but already, the signs of decay is showing in the musty corridors, peeling wall paints, and stained floorings. The elevator was speedy enough - I couldn't remember waiting a long time. The reception asked for Php1,000 deposit at our check-in which was given back to us upon check out. The rooms were somewhat ok for the price point. Clean sheets, shower room, toiletries, towels and blankets were provided. There was a fridge and TV set (with limited cable channels). The room size was pretty generous for 2-4 persons. 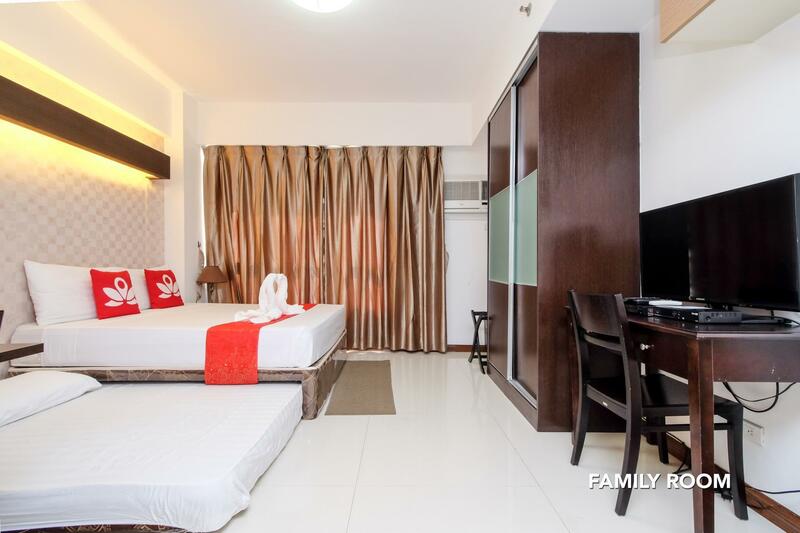 Zen Rooms served its adequate purpose which is to give us an air-conditioned room, a place to stay with great location (15 mins walk to Robinsons Forum/EDSA), and a room with a view where my family can discuss/chat. The pool was big enough and my parents had a great time swimming. shout to the one girl who's in the morning shift. She was so helpful unlike the one when I arrived at 5am she doesn't know anything and promised me things but never happend. Thanks Zen Rooms Sunshine City Suites and to KING who corresponded with me via EMAIL. I really appreciated the staff of Zen Sunshine Suites. They really were very sensitive to my needs and very attentive! i am regretful that on my trip back to manila i couldn't get a booking again! i have all praises for this hotel!!! The wi-fi in this room (1912) was EXCELLENT. A very strong signal, as the wi-fi router was located in the room next to the closet. You can't get any better than that !! You can have your room cleaned everyday but once a week was enough for me. The room cleaning girl Myla always did a great job. Also, Ella 'The Good Girl' at the 1st floor desk was always in a good mood and helpful. The elevators worked well and there is a daily English language business paper available free M-F at the front desk. The Jollibee's across the street always gave me a free copy of the Philippine Star every morning during breakfast hours. (This Jollibee's is open 24 hours a day, 7 days a week.) You must give a 1000 peso deposit when you 1st check in, which was 100% refunded to me when I checked out. Definitely a good place to stay when you are in Mandaluyong. There is a Western Union in the Forum mall on the 2nd level, but you get a better rate from the moneychanger directly above the WU on the 3rd level. This was my 1st time staying here, in Room 1912. The room was a large studio type with a good microwave and small under the counter fridge. The mattress & bed was comfy and the aircon worked without a problem all the time. The Robinson Forum mall is a short walk away with an LRT station close by the mall. A Jollibee's is right across the street, with a Shakey's Pizza & a McDonald's a little farther down the street to the east. Every Wed @ 6:30 PM there is a 'Wellness Wednesday' Zumba class at the mall. I had a great time with the Zumba ladies but did not participate because I am too old for such things !! Hahaha.... There is a Rooftop Garden on the 29th floor that gives a good nighttime view of Manila. I'll stay here again !! We booked 2 rooms for ourselves and the kids the end of last month october 2018, great pool but thats all, when we arrived they informed us they have no restaurant and there is no restaurant close by for breakfast except the usual fast food places, they advertise kitchen facilities when you book but no way, there is a sink in the room and old cupboards the microwaves had been removed, they provide a kettle but when we asked for cups to make tea or coffee they refused to provide them in fact we are informed the building is originally private letting rooms they now try to let as hotel rooms, even the reception area is very makeshift but the main problem was the whole place is filthy and both rooms where crawling with cockroaches day and night like a cockroach farm, we will never ever book this place again and subject our kids to that filth. i was so disappointed that upon check-in we got a different type of accommodation from what we booked for for the reason that they gave our slot to their previous customer who wished to extend at our expense? it was a guaranteed booking since we already paid for it. but to no avail, they left us with no choice. we transferred from one room to the other coz the first room given to us has broken bed. omg! their ad say offers wifi. yes there is a wifi router but we are having a hard time connecting to it. slower than a turtle! tsk!